Why Are Boundary Surveys So Expensive ? This is one question I seem to be hearing more and more lately, “Why are boundary surveys so expensive?” Understandably, this is one of the more common questions and there are a number of reasons. In most cases the time spent "behind the scenes" acquiring record information, researching deeds and maps, compiling field and record evidence, calculations, drafting, and preparing reports and deed descriptions can far exceeds the time spent on the site making actual field measurements and finding monuments. Now, that being said, it is the responsibility of the Land Surveyor to find existing monuments and to make an exhaustive search to locate any known record monuments, before re-establishing boundary lines. The answer to boundary surveys seldom lie in the math, it is the Land Surveyors responsibility to resolve the boundary holding the intent of the original record that created the property. This ratio between time spent on the site and time spent on research, in the office and around the site varies depending on several factors. For example, a small lot with several abutting properties may require less field time to locate boundary evidence because of the relatively close proximity, but may require the same amount of off-site work as a much larger parcel, or vice versa. It may take a day to find and locate field evidence, and 4-6 days of the "behind the scenes" work to complete the survey. There are countless legal and boundary principles to apply, verify and check before completing the survey. The cost of a boundary survey can depend on so many of the variables of the property being surveyed; size, shape, terrain, vegetation, and the amount of existing survey records in the area. The surveying process can be very similar to placing pieces in a puzzle. The first step in the process is to obtain copies of all the survey records and deeds in the area of your property. This can take several hours and depending on the age of the documents even days. The Land Surveyor is required to look at all adjoining properties, right-of-ways, and water boundaries, easements, street closures and dedications, to determine how your piece of the puzzle fits in with the adjoining pieces. Given a legal description of the property and all adjoining properties, the Land Surveyor locates the property on the ground. Once the fieldwork is completed, a Record of Survey Map is prepared that will be recorded at the County Surveyors Office. Each County Surveyors Office also requires a fee to record the survey. This fee is paid by the client directly to the County and is generally in addition to the fee for services charged by the Land Surveyor for his work. In most cases a Land Surveyor's hourly rates are at or below hourly rates of similar Professions and are more in line with that of tradesmen such as carpenters, electricians, plumbers, and auto mechanics, none of whom assume anywhere near the kind or amount of liability a Land Surveyor does. If a tradesman makes an error, he will likely be required to go back and fix the resulting problem. The resulting problem from a Land Surveyor's error may be a multi-million dollar commercial building being built in the wrong location, or a costly legal battle with an angry abutting property owner. Rarely can a Land Surveyor simply return and fix the problem resulting from an error. The Land Surveyor is a Licensed Professional and it is his responsibility to find the best resolution of the property boundary, which will hold up under the scrutiny of Law. After all property disputes are well documented throughout history and can easily be found or studied in Boundary Case Law. Our courts decide countless boundaries annually. The role of the Land Surveyor is to Monument the legal boundary on the ground and through a recorded instrument, which justifies the procedures and principals used to support his findings. The cost of a boundary survey in California is a very small percentage when compared to the price of the land being surveyed. The liability assumed by the Land Surveyor is for that piece of real property. So, when choosing your Land Surveyor please make sure that he is covered by a Professional Liability Insurance Policy and use the California Department of Consumer Affairs Board For Professional Engineers, Land Surveyors, and Geologists - License Look Up website to check his status, here is the link: http://www2.dca.ca.gov/pls/wllpub/wllqryna$lcev2.startup?p_qte_code=ENG&p_qte_pgm_code=7500. It is my intention to help you understand the role of the California Licensed Professional Land Surveyor and the scope of services he provides. Survey Monument Conservation-What Does It Mean to You ? “ Survey Monument Conservation – What Does It Mean To You ? ” This brochure was published to help explain the importance of Survey Monuments and the Legal implications of their destruction. Again, a lot of this information is not common knowledge and my hope is that it will help explain the role of the California Professional Licensed Land Surveyor, how he can help you and explain a little about what he does. conflicts and uncertainty of boundaries arises. How Can a Land Surveyor Help? and properly identify what markers may still exist near your project – and to find and recover them without destruction! What are the Benefits of Monument Conservation? easement holders, and their adjoiners. replace it after it is destroyed. identified in their original location when monuments are preserved. locations when monuments are preserved. take photos of monuments,whether original or replacement monuments. REMEMBER – $1 of prevention is worth $10 “cure” - replacing a monument AFTER it is destroyed takes 10 times the cost to protect it BEFORE it is destroyed. ...It is unlawful for any person ...to set, reset, replace, or remove any survey monument on land in which he or she has no legal interest, unless he or she has been licensed or specifically exempted from licensing under this chapter. 3. Maliciously cuts down or removes any tree upon which any such marks have been made for such purpose, with intent to destroy such marks; Is guilty of a misdemeanor. Note: These excerpts from California law have been edited to provide relevant portions in a limited space. You must refer to the complete text of the statutes and laws for full meaning and context. Well, this brochure is a very good introduction to Survey Monuments, their importance and the legal implications of destroying them. If you have any question please call or email me and I will be able to further discuss any questions you may have. Thank You to the California Land Surveyor Association for keeping us informed. ·Land Surveyors are allowed by law to enter private property. ·Land Surveyors are exempt from trespass by law. ·Performance of land survey work is in the interest of public health, safety and welfare. ·Identification of the Land Surveyor in charge should be provided. ·The Land Surveyors should provide a description of expected scope of activities and his expected time on site, where practicable. ·Your informed involvement for possible conflict resolution and mediation between parties is invaluable, both to the Land Surveyor and local property owners. ·California Penal Code Section 602.8 addresses trespass and waiver for Licensed Land Surveyors. ·Your local knowledge can be helpful and expedite the time spent on site for survey work. ·Land survey crews should respect your private property and privacy and have as little impact as possible. ·Stakes or Markers may be set that are NOT property corners, but are used for measurement purposes only. ·You should know who is working on your property as well as what land survey activities to expect. ·You should know who the Land Surveyor in charge is and his contact information and he may not be on site at all times. ·Holes may have to be dug in order to recover survey markers, then restored upon completion. a) The right of entry upon or to real property to investigate and utilize boundary evidence, and to perform surveys, is a right of persons legally authorized to practice land surveying, and it is the responsibility of the owner or tenant who owns or controls property to provide reasonable access without undue delay. The right of entry is not contingent upon the provision of prior notice to the owner or tenant. However, the owner or tenant shall be notified of the proposed time of entry where practicable. b) The requirements of subdivision (a) do not apply to monuments within access-controlled portions of freeways. 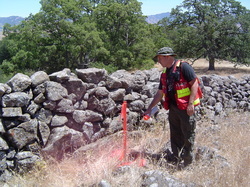 c) When required for a property survey, monuments within a freeway right-of-way shall be referenced to usable points outside the access control line by the agency having jurisdiction over the freeway when requested in writing by the Registered Civil Engineer or Licensed Land Surveyor who is to perform the property survey. The work shall be done within a reasonable time period by the agency in direct cooperation with the Engineer or Surveyor and at no charge to him. a) The right of entry upon or to real property to investigate and utilize boundary evidence, and to perform surveys, is a right of persons legally authorized to practice Land Surveying and it shall be the responsibility of the owner or tenant who owns or controls property to provide reasonable access without undue delay. The right of entry is not contingent upon the provision of prior notice to the owner or tenant. However, the owner or tenant shall be notified of the proposed time of entry where practicable. of the Business and Professions Code who is engaged in the lawful practice of Land Surveying as authorized by Section 846.5 of the Civil Code. 3) Maliciously cuts down or removes any tree upon which any such marks have been made for such purposes, with intent to destroy such marks;--Is guilty of a misdemeanor. The information contained in this brochure is to help you better understand your Rights and to help you gain a clearer perspective of the role played by the California Professional Licensed Land Surveyor.